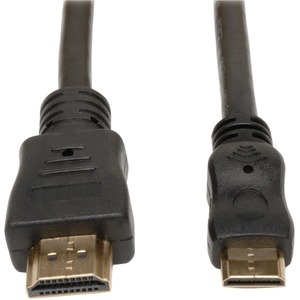 Tripp Lite's 10-ft. HDMI to Mini-HDMI High Speed with Ethernet cable allows you to connect Digital Cameras, Camcorders, and other digital devices with the mini-HDMI connector, directly to your standard HDMI enabled TV. This cable type offers the same baseline performance as standard High Speed HDMI Cable (1080p video resolution and beyond), plus an additional, dedicated data channel, known as the HDMI Ethernet Channel, for device networking. HDMI Ethernet Channel functionality is only available if both linked devices are HDMI Ethernet Channel-enabled. Cable is HDMI 1.4 compliant, which supports not only the Ethernet component, but: 3D, Audio Return Channel, 4K Support, and Content type.